These days the demand for electricity is ever increasing and one possible solution for the long term supply of electricity is nuclear fusion. Unlike current nuclear power stations, which operate on the principle of nuclear fission, fusion reactors have a number of key advantages. Nuclear fusion produces very little in the way of waste, with helium being the predominant by-product of the reaction. It also uses very small quantities of fuel to produce very large amounts of energy. For example a 1000MW coal-fired power station requires 2.7 million tonnes of coal per year, in the future it is predicted that an equivalent fusion reactor would only need 250kg of fuel. One major international project looking to produce viable energy from nuclear fusion is the International Thermonuclear Experimental Reactor (ITER). Located in France this involves collaboration between China, the EU, India, Japan, Korea, Russia and the USA. The aim is to produce a power output of 500MW for an input of 50MW, in order to make this a viable alternative to current power station technology. To get nuclear fusion a hot gas plasma has to be formed with a temperature of 150 million°C and large superconducting magnets are needed to keep this confined away from the walls of the reactor. Producing this temperature and the magnetic fields takes a very large amount of energy and it has been calculated that the ITER plant and facilities will need 110MW of electricity, rising up to 620MW during plasma operation. 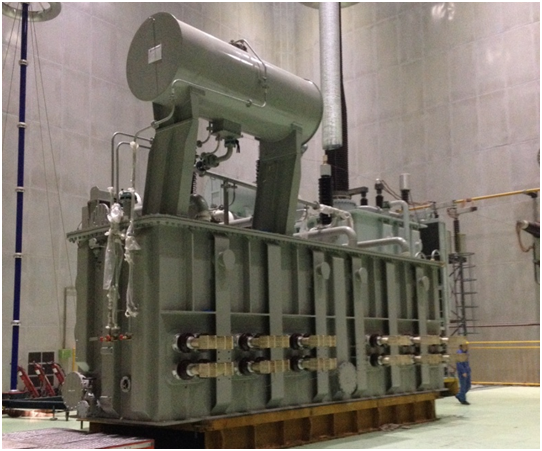 As part of the supply a number of specialised power transformers are needed to transfer the electricity from the substation to the reactor. When considering which transformer technology to use the designers of the ITER needed to find a fire safe, reliable solution as these transformers need to be located close to the reactor due to their high output current rating. The specification for the transformers therefore called for K-class fluid, in order to provide the best level of fire safety. Through collaboration with partners in China and France M&I Materials proposed MIDEL 7131 as the ideal fluid solution for these transformers. The outcome was that 14 x 82MVA MIDEL 7131 filled transformers manufactured in China. These transformers will have an output current rating of 60kA and a short circuit withstand of 360kA. The use of MIDEL 7131 in such a high profile project demonstrates the fluid’s excellent properties and track record.